Download Mr. Peabody & Sherman in Digital HD from the iTunes store. 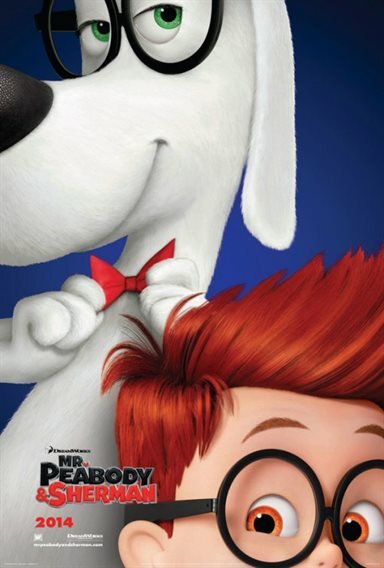 Mr. Peabody & Sherman images are © DreamWorks Animation. All Rights Reserved. Who said a old Dog can't teach new tricks? When it comes to creative concepts for cartoons, anything is possible. While many dogs in cartoons like Scooby Doo, Dino & Pluto never say a word, the talking dog isn't out of the ordinary. Just ask Underdog or Brian from family guy. But what is rare is a father and son duo. in fact Auggie and his "Dear Old Dad" are the only ones that comes to mind. But then there is the question, what happens when your a boy and your father is Man's best friend? Welcome to Sherman's world! Sherman was an orphan legally adopted at age 7 by genius canine wonder, Mr. Peabody. Now every father and son relationship has its ups and downs, but imagine what it would be like when your dad, Mr. Peabody is the smartest being on the planet. And if that wasn't enough he created the WABAC, a time machine that Mr. Peabody uses to take Sherman on the most exciting of history lessons that he's never allowed to talk about. Now since I brought up history, let's go into a lesson of our own. Mr. Peabody and Sherman is a part of 1950/60's cartoon history. Peabody and Sherman were part of The Bullwinkle show along with Fractured Fairy Tales and Dudley Do Right. I got to talk briefly with Tiffany Ward (Jay Ward's daughter) out at Comic Con 2014 and she commented how her father always wrote for adults, the little kids would enjoy the characters and voices and the teens would get some of the jokes and wonder why their parents were laughing so hard. We also talked about how back in the 50/60's cartoons introduced children to educational material & classical music and had moral lessons that while they took wild liberties, kids still learned while laughing in front of the tv on Saturday mornings. And while I was told pretty much outright that in the 80's studios realized that education doesn't sell, Tiffany Ward told me to keep my hopes up that they may return. Mr. Peabody & Sherman proves that you can still keep a animated feature educational and yet make the kids laugh at the same time! Now...Back to present day. 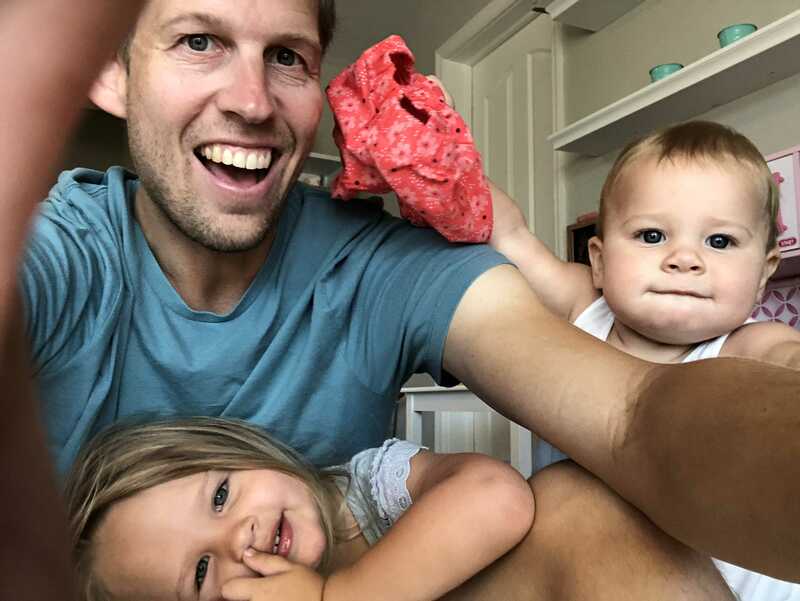 Sherman, who now is being bullied in school by his classmate Penny Peterson, if finding its tough having a dog as a father. After confronting Penny, Mr. Peabody decides it's best for Sherman to apologize and invites the Peterson's over for drinks. 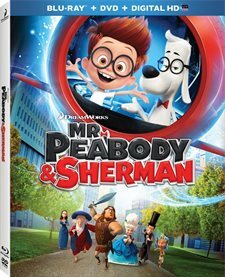 While Mr. Peabody is entertaining the parents Penny finds her way to the WABAC and off into the past Sherman & Penny go While in ancient Egypt, Penny finds herself engaged to King Tut and refuses to leave and Sherman goes back to find Mr. Peabody for help. Will Mr. Peabody and Sherman save Penny? Will they make it out of the past and back to the present day? Tune in next week to find out.......or just pick up a copy of Mr. Peabody& Sherman on Bluray & DVD available now! Extra features on the Blu-ray include the first Rocky and His Friends premier episode, a tour of the WABAC, and a few features on Mr. Peabody & Sherman, a puzzle and game and a cool featurette on Dreamworks Animation who is celebrating its 20th anniversary! While Mr. Peabody & Sherman adventures are highly entertaining, I would be wrong not to mention the brilliant vocal cast behind the animated characters. Lead by Ty Burrell as Mr. Peabody and Max Charles as Sherman, they always funny Leslie Mann plays Patty Peterson, Stanley Tucci is Leonardo da Vinci, Patrick Warburton plays King Agamemnonh and last but not least... five time Writer's Guild of America award winner, Six time Emmy winner, two time Grammy winner, 2014 People's choice winner, and the future host of The Late show Stephen Tyrone Colbert plays Penny Peterson's dad. Ok so the intro was a bit much but I'm a huge Colbert fan! And not just because of his AmeriCone Dream, but it doesn't hurt. Witty and Animated brilliantly with beautiful color and style, Mr. Peabody & Sherman will make you laugh and even teach your kids on the likes of King Tut, Marie Antoinette and even Leonardo Da Vinci. It's a blast from the past with the animated skill of the present and totally worthy for your Blu-ray collection! I give Mr. Peabody & Sherman 5 stars out of 5 and will jump in my WABAC to go back and watch it over and over again!